Should law firms fear losing clients? Many do already but just how much should they worry? The 2016 Altman Weil CLO Survey provides insight. By my read, 70% of clients are a flight risk. In my view, only questions 2 and 4 do not represent risk of switching behavior (flight): “We are generally satisfied” at 17.4% and “We asked for change and got it” at 13.4%. That’s about 30%. The rest the answers represent the mindset of clients willing to switch firms. What can law firm leaders do to minimize the risk of losing clients? The survey cites actions such as better client service, better legal expertise, lower fees, and managing matters more efficiently. (See page 13.) Many of my blog posts explain how lawyers can practice law more efficiently. I close with further detail about flight risk: when law firms lose business, they lose mainly to competitors or clients. Many commentators, however, say alternative providers (non-law-firms) will eat law firms’ lunches. 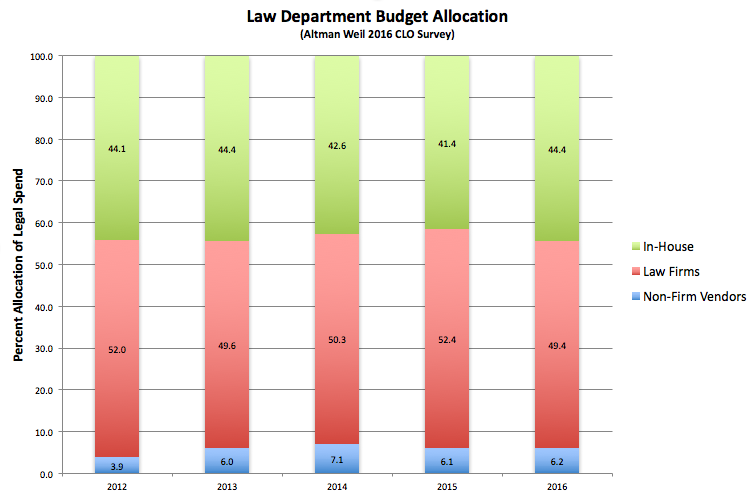 I don’t see it in the data: the chart below shows, for the last five years, the allocation of law department spending on alternate providers, law firms, and law departments. The share of non-firm vendors since 2011 averages 6.5% with little change. 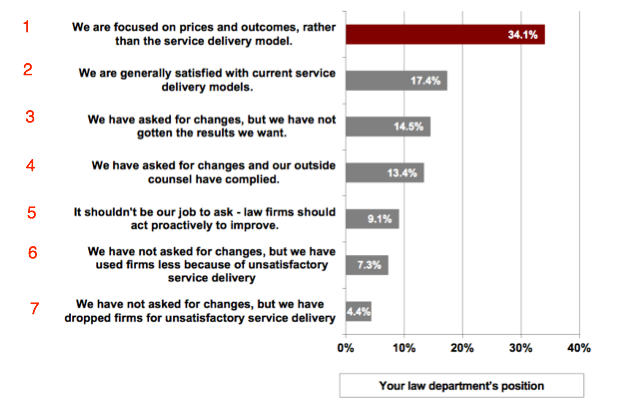 If alternative providers were growing rapidly relative to law firms, we would see this percentage increasing.